Aminzare, M., Aliakbarlu, J., Tajik, H. (2015). The effect of Cinnamomum zeylanicum essential oil on chemical characteristics of Lyoner- type sausage during refrigerated storage. Veterinary Research Forum, 6(1), 31-39. Majid Aminzare; Javad Aliakbarlu; Hossein Tajik. "The effect of Cinnamomum zeylanicum essential oil on chemical characteristics of Lyoner- type sausage during refrigerated storage". Veterinary Research Forum, 6, 1, 2015, 31-39. Aminzare, M., Aliakbarlu, J., Tajik, H. (2015). 'The effect of Cinnamomum zeylanicum essential oil on chemical characteristics of Lyoner- type sausage during refrigerated storage', Veterinary Research Forum, 6(1), pp. 31-39. Aminzare, M., Aliakbarlu, J., Tajik, H. The effect of Cinnamomum zeylanicum essential oil on chemical characteristics of Lyoner- type sausage during refrigerated storage. 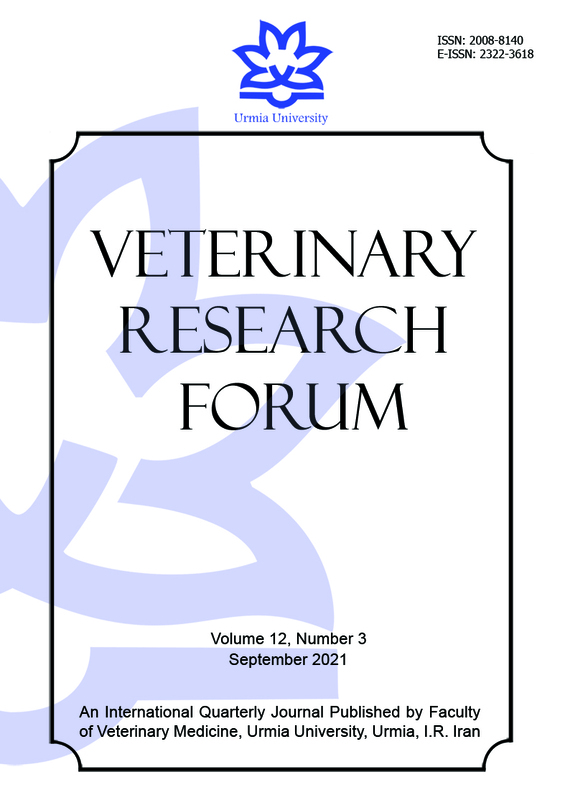 Veterinary Research Forum, 2015; 6(1): 31-39. The effect of Cinnamomum zeylanicum essential oil (CZEO) at two concentrations (0.02% and 0.04% v/w) on chemical composition, pH, water activity (aw), lipid oxidation, color stability and sensory characteristics of Lyoner-type sausage stored at 4 ˚C for 40 days was investigated. The moisture content of the control sample was higher (p < 0.05) than CZEO incorporated samples, while fat, ash and protein content were not affected by adding essential oil. At days 0 and 40, Lightness (L*) and whiteness index (WI) were significantly decreased and total color difference (ΔE) significantly increased (p < 0.05) by adding CZEO. With the exception of first day of storage, redness (a*) and yellowness (b*) were significantly increased and decreased, respectively during the rest of storage (p < 0.05). The pH values were not differing between the control samples and samples containing CZEO (p > 0.05). The water activity content fell in Lyoners with added CZEO during the storage. Incorporation of CZEO retard lipid oxidation process at the end of storage (p < 0.05). Samples containing highest amount of CZEO had higher sensory score compared to control sample. Our results pointed out that CZEO could be used as natural additive for increasing the chemical stability of Lyoner-type sausages. The essential oils have been extensively used in food products, for their antibacterial, antifungal and antioxidant properties as well as food flavoring agents.7 The main advantage of EOs is that they can be used in any food and are generally recognized as safe,8 providing that their maximum effects are attained with minimal change in the organoleptic properties of the food.9 The use of natural additives has attracted attention, reportedly natural compounds have antioxidant effects similar to or better than those of synthetic preservatives.10 The EOs contain many phytochemicals including phenolic compounds like flavonoids, which are sources of natural antioxidants. Their antioxidant activity depends upon their ability to interact with free radicals.11 In addition to antioxidant activity, herbal compounds have antimicrobial, anti-inflammatory, anti-mutagenic and anti-cancer activities, which have positive effects on functionality of foods against diseases.12-15 Cinnamon (Cinnamomum zeylanicum or C. verum), rich in essential oils (EO), belongs to Lauraceae family and usually grows in South and South-EastAsia.16 The inner bark of the tree has been used in ethno-medicine and flavoring for foods.5 The C. zeylanicum essential oil (CZEO) contains a distinct antioxidant activity, which is attributed to the presence of phenolic and poly-phenolic compounds.17,18 The CZEO acted as a good inhibitor of primary and secondary oxidation products formation in mustard oil at the concentration of 0.02%.19 The ability of C.zeylanicum to retard lipid oxidation is attributable to quenching of reactive oxygen species by its phenolic constituents.20 The objective of this study, was to investigate effect of CZEO on the chemical characteristics of Lyoner-type sausage. Sausage manufacture. The Lyoner-type sausages were manufactured in Dara meat products factory located in Shahriar, Iran, according to a traditional formula: 10 kg chicken meat , 13 kg modified deboned chicken meat, 4.6 kg supplement cream including soy, emulsifier, oil, water, 1.6 kg oil, 8.8 kg ice, garlic, white egg, salt, nitrite, dextrose, flour, starch, phosphate, spice,stabilizer, and ascorbic acid. Chicken meat, salt, phosphate and nitrite were placed in a cutter and mixed for 1 min. Fifty percent of the ice and spice were then added and mixed at a high speed. After complete homogenization, the speed of the cutter was reduced. The remaining 50% of ice, starch, ascorbic acid oil were added and mixed until the temperature of the mixture reached 13 ˚C. The total emulsification time was approximately 10 min. The resulting batter was divided into three parts of 5 kg. To obtain different Lyoner samples, various concentrations of CZEO(0.02% and 0.04% v/w) was added to the two divided sample parts. The batters were stuffed into polyamide bags (50 mm caliber; Poshesh Navid, Tehran, Iran) and were cooked by put in cooking room using the following program: 85 ˚C until the temperature of the product reached 73 ˚C (measured by a thermometer inserted into the center of the packed sausage batter). The cooked sausage was cooled in a water bath for 10 min and stored in a controlled chamber at 4 ˚C before analysis at 0, 10, 20, 30 and 40 days. Identification and quantification of CZEO chemical constituents. The chemical components ofCZEO were identified by gas chromatography with mass spectrometry (GC-MS). A gas chromatograph (Model GC 17A; Shimadzu Corp., Kyoto, Japan) equipped with a mass selective detector (Model QP 5000; Shimadzu Corp., Kyoto, Japan) was operated under the following conditions: fused silica capillary column (30 m, .25 mm) coated with a DB-5 MS stationary phase; ion source temperature of 220 ˚C; column temperature programmed at an initial temperature of 40 ˚C and increased by 3 ˚C per min up to 240 ˚C; helium carrier gas (1 mL per min); initial column pressure of 100 kPa; split ratio of 1:10 and volume injected of 1 µL (1% solution in dichloromethane). where, Ablank is the absorbance of the control reaction (containing all reagents except the test compound), and Asample is the test compound’s absorbance. BHT (1 mg mL-1) was used as a positive control.24 All tests were carried out in triplicate and results are reported as mean ± standard deviation of triplicates. Measuring composition of sausage samples. Moisture, ash, protein and fat content of sausage samples were determined by AOAC methods.25 Moisture (g water per 100g sample) was determined by drying a 3 g sample at 105 ˚C to constant weight. Ash was performed at 550 ˚C for 2 hr (g ash per 100 g sample). Fat (g fat per 100 g sample) was calculated by weight loss after a six cycle extraction with petroleum ether in a Soxhlet apparatus (Fisher Scientific, Loughborough, UK). Protein (g protein per 100 g sample) was analyzed according to the Kjeldahl method.25 A factor of 6.25 was used for the conversion of nitrogen to crude protein. pH and water activity measurement. The pH was measured by blending a 10 g sample with 90 mL deionized water for 2 min. The pH of the obtained suspension was measured with a Crison pH meter (Model 507; Crison, Barcelona, Spain) equipped with a Crison combination electrode (Cat. no. 52; Crison, Barcelona, Spain). The water activity (aw) was measured at 25 ˚C using an electric hygrometer (Model TH200; Novasina; Axair Ltd., Pfaeffikon, Switzerland) according to the manufacture instruction. Lipid oxidation. Degree of lipid oxidation in different samples was performed using an extraction method of thiobarbituric acid reactive substances (TBARs) method as described previously with minor modifications.29 A meat sample (10 g) was homogenized with 35 mL of cold (4 ˚C) extraction solution containing 4% per chloric acid and 1 mL of butylated hydroxy toluene (BHT) (5 g L-1) at 13,500 rpm for 1 min. The blended sample was filtered through Whatman filter paper no. 1 (Whatman International Ltd., Maidstone, USA) into a 50-mL falcon tube. The filtrate was adjusted to 50 mL with 4% perchloric acid and 5 mL this mixture was added to 5 mL of thiobarbituric acid (TBA) solution (0.02 mol L-1). The mixture was vortexed and then incubated in a water bath at 100 ˚C for 60 min to develop the malonaldehyde – TBA complex. The absorbance at 532 nm was measured after the solution had been cooled with cold tap water for 10 min. Values of TBARs were expressed as mg malonaldehyde per kgof sample. 1,1,3,3-tetraethoxypropane (TEP) was used for preparation of standard curve. Sensory evaluation. Non-trained panelists (30) were recruited from the staff and postgraduate students of Department of Food Hygiene, Faculty of Veterinary Medicine, Urmia University, Urmia, Iran.30 A preparatory session was held prior to the testing, so that each panel members could thoroughly discuss and clarify each attribute in samples. Testing was initiated after the panelists agreed on the specifications, in the Food Hygiene Laboratory of Urmia University, Urmia, Iran. The 9-point hedonic scale was carried out. During evaluation, the panelists were situated in private booths under incandescent light. Circle pieces were cut from the center of Lyoner slices and were served at room temperature.31 The sample presentation order was randomized for each panelist. Room temperature water was provided between samples to cleanse the palate. The attributes measured and their descriptors were as follows: for taste; acid taste, saltiness, and fatness (from imperceptible to extremely intense), for odor (from imperceptible to extremely intense); for color (from extremely light to extremely dark); and for texture: hardness (from extremely soft to extremely tough), juiciness (from extremely dry to extremely moist). At the end of the test, panelist gave a score for overall acceptability from 1 to 9. Statistical analysis. Conventional statistical methods were used to calculate means and standard deviations. Statistical analysis (ANOVA) was applied to the data to determine differences (p < 0.05). To discover whether there were significant differences between the levels of the main factor, contrasts (Tukey’s test) between means were made.32 The data were analyzed by SPSS (Version 16; SPSS Inc., Chicago, USA). Chemical characterization of CZEO. As shown in Table 1, seventeen compounds of CZEO were identified, representing 93.15% of the total EO. The major compound groups were monoterpene hydrocarbons and phenolic compounds. Cinnamaldehyde (80.42%), α-Copaene (2.73%) and trans-Calamenene (2.16%) were the major chemical constituents of the oil. Other components analyzed in the oil were present in amounts less than 2.00%. Antioxidant activity. TheDPPH scavenging assay was used to indicate antioxidant activity of CZEO. This assay was based on the ability of DPPH, a stable free radical, to be quenched and thereby decolorize in the presence of antioxidants resulting in a reduction in absorbance values. The results showed that DPPH scavenging activity significantly was increased (p < 0.05) with increasing EO concentration as shown in Figure 1. Table 1. Chemical constituents of Cinnamomum zeylanicum essential oil. ** Kovats indices calculated against n-alkanes on HP-5 column. Fig. 1. Free radical scavenging activity (%) of CZEO evaluated by DPPH assay. BHT (1 mg mL-1) was used as a positive control. abcd Different letters indicate significant differences among the DPPH scavenging activities (p < 0.05). Measuring composition of sausage samples. The chemical composition of Lyoners is shown in Table 2. The moisture content fell in all the CZEO samples with the comparison to control sample, with no statistically significant differences (p > 0.05) between the CZEO 0.02% and CZEO 0.04% samples. The fat, protein and ash content did not show significant differences (p > 0.05) as a result of the addition of CZEO. Colormeasurement. Table 3 shows color characteristics of sausages in accordance with the hunter system (L*, a*, b* color values), total color difference (ΔE) and whitish index (WI). In day 0 and 40, Lightness (L*) was significantly (P < 0.05) decreased by adding CZEO. No significant differences (p > 0.05) were found between the lightness of samples during 40 days storage in any samples.Redness (a*) and yellowness (b*) were significantly (p < 0.05) affected by the CZEO content. With the exception of first day of storage, these parameters were increased and decreased, respectively. Adding CZEO at day 0 and 40 resulted in a significant increase in total color difference (ΔE) and decrease in WI, (p < 0.05). pH and water activity measurement. The pH values did not differ (p > 0.05) between the control and Lyoners containing CZEO, (Table 4). This parameter was significantly different in all of samples during the 40 days storage, except days 10 and 20 in samples containing CZEO. The water activity content fell in Lyoners with CZEO compared with the control samples, with no significant differences (p > 0.05) between CZEO 0.02% and CZEO 0.04% samples at the first day of storage, (Table 4). But during storage time, water activity of control samples and the samples with CZEO decreased and increased respectively. Lipid oxidation. Table 5 shows the effect of CZEO addition and storage time on the lipid oxidation of Lyoner. There was no significant difference between TBARs values of CZEO containing samples and control after 40 days of storage at 4 ˚C. All treated samples showed lower TBARs values than control and increasing of CZEO caused to decrease the TBARs values, but there was no statistically significance difference between them (p > 0.05). The TBARs values of all samples had an increasing trend during storage time, with statistically significant differences (p < 0.05) between days of storage. Sensory evaluation. The results of sensory assessment of Lyoner samples are shown in Table 6. In general, samples with CZEO had the higher scores than control sample. Regarding to odor, the score of CZEO 0.04% sample was significantly higher than other samples (p < 0.05). The taste, color and overall acceptability scores of samples with CZEO were higher than control one, but there were no significant difference between them (p > 0.05). The texture of all samples was not significantly affected by addition CZEO (p > 0.05). Table 2. Chemical composition of Lyoner formulated with CZEO (Mean ± SD). * indicates significant differences compared to control (p < 0.05). Table 3. Color coordinates of Lyoners formulated with CZEO during 40 days of storage at 4˚C (Mean ± SD). ABC Values followed by the same capital letter within the same column are not significantly different (p > 0.05). abc Values followed by the same small letter within the same row are not significantly different (p > 0.05). Table 4. pH and water activity values of Lyoners formulated withCZEO stored at 4 ˚C (Mean ± SD). AB Values followed by the same capital letter within the same column are not significantly different (p > 0.05). Table 5. Thiobarbituric acid reactive substances values (mg malonaldehyde per kg sample) of Lyoners formulated with CZEO, during 40 days of storage at 4 ˚C (Mean ± SD). There is no statistically significant difference among the values in the same column (p > 0.05). abcd Values followed by the same small letter within the same row are not significantly different (p > 0.05). Table 6. Sensory scores of Lyoners formulated with CZEO, during 40 days of storage at 4 ˚C (Mean ± SD). ab Values followed by the same small letter within the same row are not significantly different (p > 0.05). Lightness in food is related with many factors, including the concentration and type of pigments present,47 water content,48 and essential oils content and type.49 The results showed that by increasing CZEO concentration, L* values were decreased and color of samples tended to darken. Regarding to pH values, CZEO did not show statistically significant effect (p > 0.05) on pH in each day of storage days, while time was the most influential factor in this respect. In the control, CZEO 0.02% and CZEO 0.04% samples, the pH significantly decreased from 6.86 at day 0 to 6.08, 6.12 and 6.14, respectively, at day 40 (p < 0.05). In conclusion, the addition of spice essential oils such as cinnamon seems to be a technologically viable alternative for elaborating cooked meat products because the ”natural” image of the products is improved. However the new and beneficial aspects of innovative products must be properly communicated to the consumer in an easily comprehensible manner. In the case of Lyoner, CZEO improve acceptance and have desirable effects as regards oxidative stability. The addition of CZEO alone and in combination with other preservative agents and methods (such as other plant-originated antioxidant agents or vacuum packaging) should be considered as a good method to improve chemical characteristics of Lyoner-type sausage. This work was financially supported by the Faculty of Veterinary Medicine, Urmia University, Urmia, Iran and Dara Meat Products Factory, Shahriar, Iran. Feiner G. Meat products handbook practical science and technology. Boca Raton, USA: CRC Press 2006. Burt S. Essential oils: Their antibacterial properties and potential applications in foods: A review. Int J Food Microbiol 2004; 94: 223-253. Lunn J, Buttriss JL. Carbohydrates and dietary fiber. Br Nutr Foundation Nutr Bull 2007; 32: 21-64. Viuda-Martos M, Lopez-Marcos MC, Fernandez-Lopez J, et al. The role of fiber in cardiovascular diseases: A review. Comp Rev in Food Sci Food Safety 2010; 9(2): 240-258. Bakkali F, Averbeck S, Averbeck D, et al. Biological effects of essential oils: A review. Food Chem Toxicol 2008; 46: 446-475. Ayala-Zavala JF, Oms-Oliu G, Odriozola-Serrano I, et al. Bio-preservation of fresh-cut tomatoes using natural antimicrobials. Eur Food Res Technol 2007; 226: 1047-1055. Viuda-Martos M, Ruiz-Navajas Y, Fernandez-Lopez J, et al. Effect of orange dietary fiber, oregano essential oil and packaging conditions on shelf-life of bologna sausages. Food Control 2009; 21(4): 436-443. Food additive status list. U.S. Food and Drug Administration. Available at: http://www.fda.gov/ food/ingredientspackaginglabeling/foodadditivesingredients/ucm091048.htmAccessed Jul 20, 2009. Viuda-Martos M, Ruiz-Navajas Y, Fernandez-Lopez J, et al. Antifungal activity of lemon (Citrus lemon L.), mandarin (Citrus reticulate L.), grapefruit (Citrus paradisi L.) and orange (Citrus sinensis L.) essential oils. Food Control 2008; 19: 1130-1138. Sebranek JG, Sewalt VJH, Robbins KL, et al. Comparison of a natural rosemary extract and BHA/BHT for relative antioxidant effectiveness in pork sausage. Meat Sci 2005; 69: 289-296. Dawidowicz AL, Wianowska D, Baraniak B. The antioxidant properties of alcoholic extracts from Sambucus nigra L. (antioxidant properties of extracts). LWT Food SciTechnol 2006; 39: 308-315. Khader M, Bresgen N, Eckl PM. Antimutagenic effects of ethanolic extracts from selected Palestinian medicinal plants. J Ethnopharmacol 2010; 127: 319-324. Liu X, Zhao M, Wang J, et al. Antimicrobial and antioxidant activity of Emblica extracts obtained by supercritical carbon dioxide extraction and methanol extraction. J Food Biochem 2009; 33: 307-330. Madhuri S, Pandey G. Some anticancer medicinal plants of foreign origin. Curr Sci 2009; 96: 779-783. Namsa ND, Tag H, Mandal M, et al. An ethnobotanical study of traditional anti-inflammatory plants used by the Lohit community o Arunachal Pradesh. India J Ethnopharmacol 2009; 125: 234-245. Mishra A K, Mishra A, Bhargava A, et al. Antimicrobial activity of essential oils from the leaves of Cinnamomum spp. Nat Aca Sci Lett 2008; 31: 341-345. Chericoni S, Prieto JM, Iacopini P, et al. In vitro activity of the essential oil of Cinnamomum zeylanicum and eugenol in peroxynitrite-induced oxidation processes. J Agric Food Chem 2005; 53: 4762-4765. Jayaprakasha GK, Ohnishi-Kameyama M, Ono H, et al. Phenolic constituents in the fruits of Cinnamomum zeylanicum and their antioxidant activity. J Agric Food Chem 2006; 54: 1672-1679. Singh G, Maurya S, De Lampasona MP, et al. A comparison of chemical, antioxidant and antimicrobial studies of cinnamon leaf and bark volatile oils, oleoresins and their constituents. Food Chem Toxicol 2007; 45: 1650-1661. Mathew S, Abraham TE. Studies on the antioxidant activities of cinnamon (Cinnamomum verum) bark extracts, through various in vitro models. Food Chem 2006; 94:520-528. Oliveira MMM, Brugnera DF, Cardoso MG, et al. Disinfectant action of Cymbopogon sp. essential oils in different phases of biofilm formation by Listeria monocytogenes on stainless steel surface. Food Control 2010; 21: 549-553. Adams RP. Identification of essential oils components by gas chromatography/quadrupole mass spectroscopy. 4th ed. Carol Stream, USA: Allured Publishing 2007: 804. Amarowicz R, Pegg RB, Rahimi-Moghaddam P, et al. Free radical scavenging capacity and antioxidant activity of selected plant species from the Canadian prairies. Food Chem 2004; 84: 551-562. Aliakbarlu J, Khalili Sadaghiani S, Mohammadi S. Comparative evaluation of antioxidant and anti-food-borne bacterial activities of essential oils from some spices commonly consumed in Iran. Food Sci Biotechnol 2013; 22(6): 1487-1493. AOAC. Official Methods of Analysis of the Association of Official Analytical Chemistry. 16th ed. Washington, USA. AOAC International 1995: 1141. Cassens RG, Demeyer D, Eikelenboom G, et al. Recommendation of reference method for assessment of meat color. In proceedings: The 41st international congress of meat science and technology. San Antonio, USA: 1995; 410-411. Hunt MC, Acton JC, Benedict RC, et al. Guidelines for meat color evaluation. Chicago, USA: American meat science association and national livestock and meat board 1991; 1-12. Mehdizadeh T, Tajik H, Razavi Rohani SM, et al. Antibacterial, antioxidant and optical properties of edible starch-chitosan composite film containing Thymus kotschyanus essential oil. Vet Res Forum 2012; 3(3): 167-173. Ulu H. Evaluation of three 2-thiobarbituric acid methods for the measurement of lipid oxidation in various meat sand meat products. Meat Sci 2004; 67:683-687. Cutter NC. Opportunities for bio based packaging technologies to improve the quality and safety of fresh and further processed muscle foods. Meat Sci 2006; 74(1): 131-142. American Society for Testing and Materials. Standard and sensory evaluation of materials and products. Philadelphia, USA: 1988. Viuda-Martos M, Ruiz-Navajas Y, Fernández-López J, et al. Effect of added citrus fiber and spice essential oils on quality characteristics and shelf-life of mortadella. Meat Sci 2010; 85: 568-657. Moarefian M, Barzegar M, Sattari M. Cinnamomum Zeylanicum essential oil as a natural antioxidant and anti-bacterial in cooked sausage. J Food Biochem 2011; 1-8. El-Baroty GS, El-Baky HHA, Farag, RS, et al. Characterization of antioxidant and antimicrobial compounds of cinnamon and ginger essential oils. Afr J Biochem Res 2010; 4: 167-174. Senanayake UM, Lee TH, Wills RBH. Volatile constituents of cinnamon (Cinnamomum zeylanicum) oils. J Agric Food Chem 1978; 26: 822-824. Simic A, Sokovic MD, Ristic, M, et al. The chemical composition of some Lauraceae essential oils and their antifungal activities. Phytother Res 2004; 18: 713-717. Wijesekera ROB, Jayewardene AL, Rajapakse LS. Volatile constituents of leaf, stem and root oils of cinnamon (Cinnamomum zeylanicum). J Sci Food Agric 1974; 25:1211-1220. Baratta MT, Dorman HJD, Deans SG, et al. Antimicrobial and antioxidant properties of some commercial essential oils. Flavour Fragr J 1998; 13(4): 235-244. Bin Jantan I, Moharam BAK, Santhanam J, et al. Correlation between chemical composition and anti-fungal activity of essential oils of eight Cinnamomum species. Pharm Biol 2008; 46(6): 406-412. Kaul PN, Bhattacharya AK, Rao BRR, et al. Volatile constituents of essential oils isolated from different parts of cinnamon (Cinnamomum zeylanicum Blume). J Sci Food Agric 2003; 83: 53-55. Marongiu B, Piras A, Porcedda S, et al. Supercritical CO2 extract of Cinnamomum zeylanicum: Chemical characterization and anti tyrosinase activity. J Agr Food Chem 2007; 55(24): 10022-10027. Shahverdi AR, Monsef-Esfahani HR, Tavasoli F, et al. Trans-cinnamaldehyde from Cinnamomum zeylanicum bark essential oil reduces the clindamycin resistance of Clostridiumdifficileinvitro. J Food Sci 2007; 72(1): 55-58. Yang YC, Lee HS, Lee SH, et al. Ovicidal and adulticidal activities of Cinnamomum zeylanicum bark essential oil compounds and related compounds against pediculus humanus capitis (Anoplura: Pediculicidae). Int J Parasitol 2005; 35(14): 1595-1600. Erich S, Leopold J, Gerhard B, et al. Composition and antioxidant activities of the essential oil of cinnamon (Cinnamomum zeylanicum Blume) leaves from Sri Lanka. J Essent Oil Bear Pl 2006; 9(2): 170-182. Pyo YH, Lee TC, Logendra L, et al. Antioxidant activity and phenolic compounds of Swiss chard (Beta vulgaris subspecies cycla) extracts. Food Chem 2004; 85: 19-26. Viuda-Martos M, Ruiz-Navajas Y, Sanchez-Zapata E, et al. Antioxidant activity of essential oils of five spice plants. Flavour Frag J 2010; 25(1): 13-19. Lindahl G, Lundstrom K, Tornberg E. Contribution of pigment content, myoglobin forms and internal reflectance to the lightness of pork loin and ham from pure breed pigs. Meat Sci 2001; 59: 141-151. Aleson L, Fernández-Ginés JM, Fernández-López J, et al. Dietary fiber in food [Spanish]. Alimentación Equipos y Tecnología 2002; 169: 83-90. Fernandez-Gines JM, Fernandez-Lopez J, Sayas-Barbera E, et al. Effect of storage conditions on quality characteristics of bologna sausages made with citrus fiber. J Food Sci 2003; 68(2): 710-715. Fernandez-Lopez J, Sayas-Barbera ME, Navarro C, et al. Antioxidant and antibacterial activities of natural extracts: Application on cooked meat balls. Meat Sci 2005; 69: 371-380. American Meat Science Association. Guidelines for meat color evaluation. In proceedings: The 44th annual reciprocal meat conference. Kans, Chicago 1991; 3-17. Oliveira TLC, Carvalho SM, Soares RA, et al. Antioxidant effects of Satureja montana L. essential oil on TBARS and color of mortadella-type sausages formulated with different levels of sodium nitrite. J Food Sci Technol 2012; 45: 204-212. Estévez M, Ventanas S, Cava R. Protein oxidation in frankfurters with increasing levels of added rosemary essential oil: Effect on color and texture deterioration. J Food Sci 2005; 70: C427-C432. Robertson JA, De Monredon FD, Dysseler P, et al. Hydration properties of dietary fibre and resistant starch: A European collaborative study. J Food Sci Technol 2000; 33: 72-79. Kulisic T, Radonic A, Katalinic V, et al. Use of different methods for testing antioxidative activity of oregano essential oil. Food Chem 2004; 85(4):633-640. Choe E, Min DB. Mechanisms of antioxidants in the oxidation of foods. Comp Rev Food Sci Food Safety 2009; 8: 345-358. Russo A, Acquaviva R, Campisi A, et al. Bioflavonoids as antiradicals, antioxidants and DNA cleavage protectors. Cell Biol Toxicol 2000; 16(2): 91-98. You KM, Jong HG, Kim HP. Inhibition of cyclo-oxygenase/lipoxygenase from human platelets by polyhydroxylated/methoxylated flavonoids isolated from medicinal plants. Arch Pharm Res 1999; 22(1):18-24. Al-Mamary M, Al-Meeri A, Al-Habori M. Antioxidant activities and total phenolics of different types of honey. Nutr Res 2002; 22: 1041–1047. Ojagh SM, Rezaei M, Razavi SH, et al. Effect of chitosan coatings enriched with cinnamon oil on the quality of refrigerated rainbow trout. Food Chem 2010; 120: 193-198.